What is its total floor area? What percent of the exterior will be glass? How much energy will the building consume? 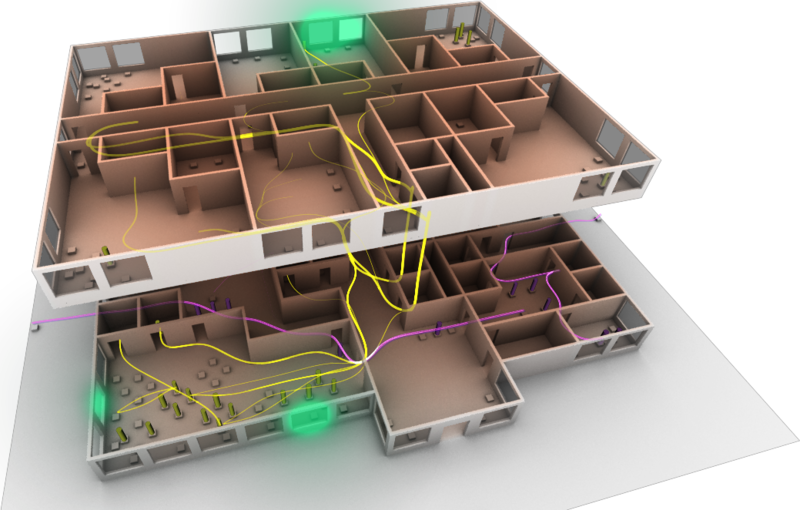 How will people experience the indoor environment? Questions 1 & 2 treat the building as a structure. They are part of a larger question: What will the building look like? Tools such as Revit will help you communicate the answer. Questions 3 & 4, on the other hand, regard the building as a system. They relate to the larger question: How will the building function? The recently released Insight 360 tool will automatically convert your Revit model into an energy model, and help you estimate the building’s environmental performance. The tools of the future will help you do even more. In the future, architects will truly design buildings as systems. Their models will incorporate not only the physical characteristics of a building, but also the control logic driving its HVAC system and the social interactions that occur among its occupants. Human behavior affects the building, as people take action to influence indoor temperature, lighting, and ventilation. The building in turn affects human behavior. Future systems design tools will help architects simulate and visualize these complex relationships. The above is a simulation of hotel at around 12:00 noon. The warm outdoor air is heating the building from the outside in, as shown by the red-to-blue color gradient. The yellow cylinders represent hotel guests, and the yellow speedlines reveal their movements. Some guests are entering the building (bottom middle). Some are having lunch in the restaurant (bottom right). Some are traveling to and from their hotel rooms on the upper floor (top). It is now warmer inside the building than outside. The green glow effects indicate windows being opened by occupants who want to accelerate the cooling of the indoor environment. Autodesk’s Complex Systems Research group is investigating how to help people design systems. 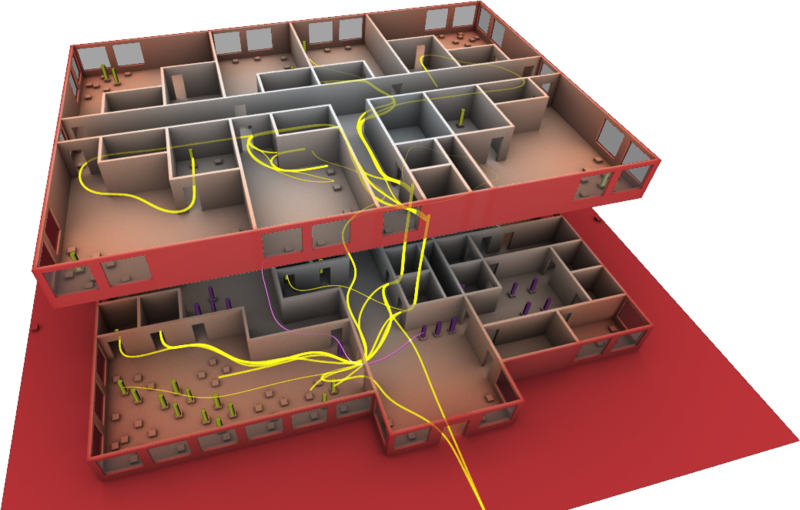 Our publications on customizable simulated behavior, new building simulation algorithms, and multiscale visualization techniques describe the architectural design research that led to the images above. We also study systems approaches that could be applied not only to sustainable buildings but also Internet of Things devices, biomedical advancements, and other pressing challenges. The systems design tools of the future must be easy to use, yet they must also scale. 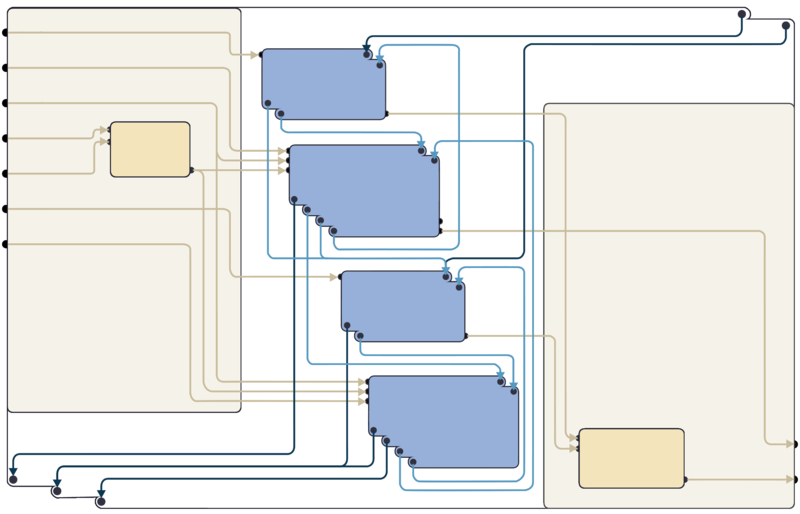 This suggests a combination of visual programming to simplify the task of modeling behavior, and systems theory to ensure that even the most challenging design problems become tractable. The layout above places the simulation elements (blue) in the middle, with dataflow elements (yellow) on either side. 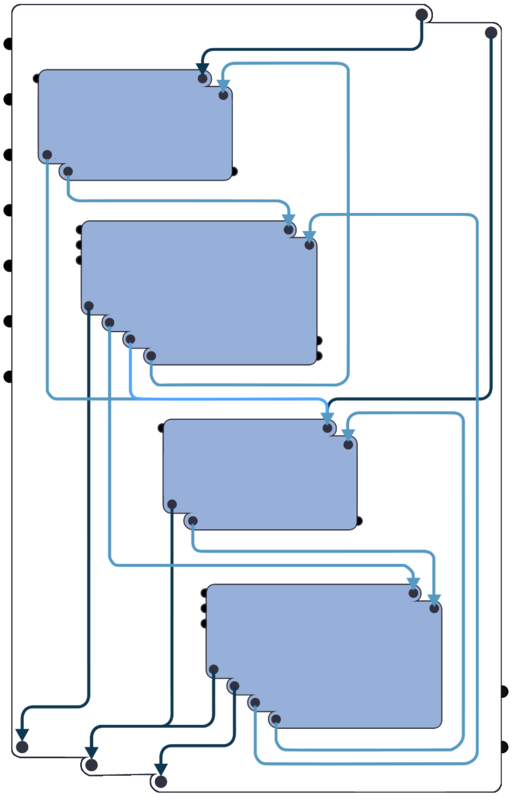 The dataflow graph on the left is processed before the simulation, and the dataflow graph on the right is processed at the end. The black dots on the far left are ports representing parameters. The dots on the far right are ports representing performance metrics. These mockups are described in our paper, Designing DEVS Visual Interfaces for End-User Programmers. The most challenging aspect of a complex systems model is that it must inevitably incorporate the expertise of multiple collaborators. People must work together, and future design tools must help them. 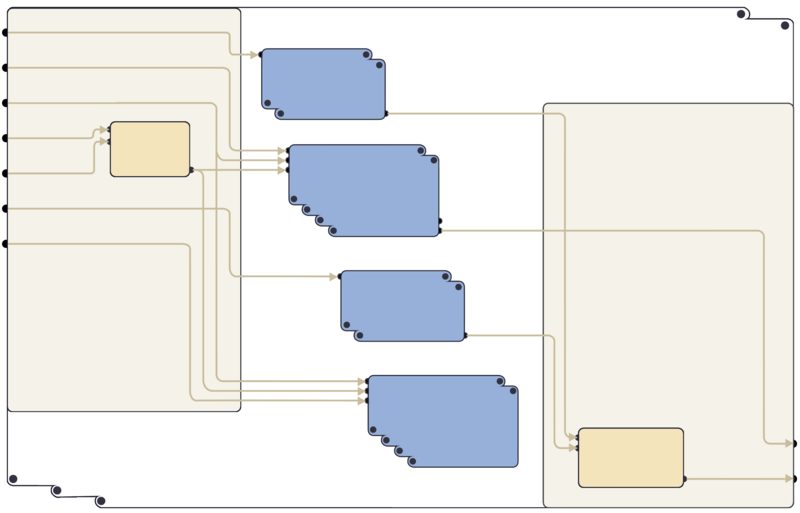 The images above depict a systems model with 4 simulation models. To promote collaboration to the fullest extent, each simulation model should correspond with a different area of expertise. For example, one model might represent the flow of heat through a building, another might represent natural and artificial lighting, another the behavior of building occupants, and the last might estimate resource consumption. In other words, each component of the overall system is itself system. And within these systems there may be more systems. The success of future systems design tools depends on the extent to which they help experts collaborate. Their promise is to give designers a better understanding of how things will function, and how people will experience the built environment. Here is a video showing how some of the systems described above may interact and affect each other. Enjoy!